Updated on 22/3/2015: We first posted this in December 2013, reporting that between 2011-12 and 2012-13 the number of people resorting to foodbanks close to tripled. Since then the Trussell Trust issued new figures showing this leap happened again between 2012-13 and 2013-14, with yet another close to tripling of users (up 2.6 times). We have updated the graph to show this. 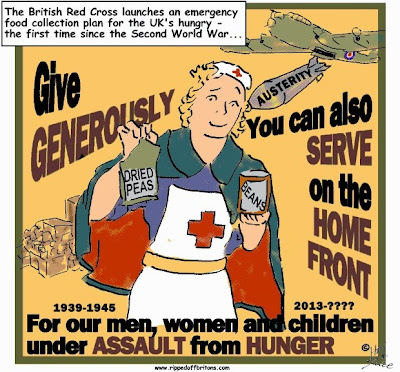 "Trussell Trust foodbanks have seen the biggest rise in numbers given emergency food since the charity began in 2000. 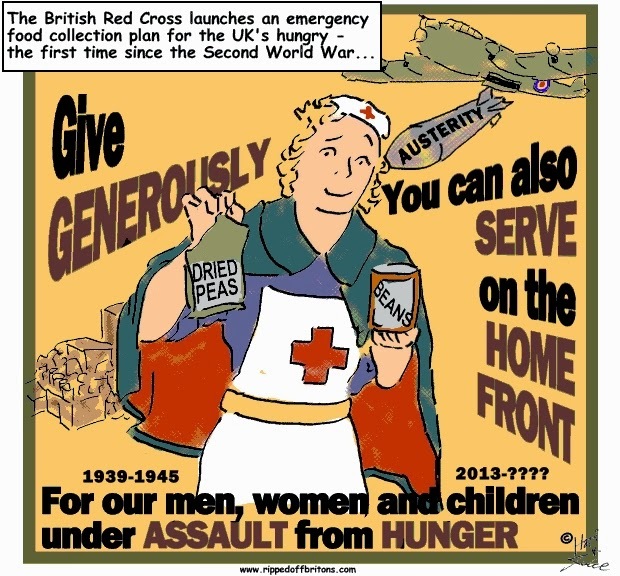 Almost 350,000 people have received at least three days emergency food from Trussell Trust foodbanks during the last 12 months, nearly 100,000 more than anticipated and close to triple the number helped in 2011-12." "Food bank use has been increasing steadily since 2005. In the period April-September 2013 alone, over 350,000 people received food from Trussell Trust food banks – triple the number helped in the same period in 2012. These figures have led the Trussell Trust to call for an inquiry into the causes of food poverty and the surge in food bank usage. A range of experts have also warned in the British Medical Journal (December 2013) that UK food poverty “has all the signs of a public health emergency that could go unrecognised until it is too late to take preventive action.”"
"Food prices rose 22%, in the UK between January 2007 and May 2013 while rising only 12% in Germany and 13% in France. Averaged across the EU food prices rose 17% over the same time period." "We estimate that the poorest 10% of households in the UK spent nearly a quarter (23.8%) of their gross income on food and non-alcoholic beverages in 2012. This is in stark comparison with just 4.2% for the richest 10% of households."